Transact International, a US-based third party logistics provider, has started the first non-military cargo charter service into the Shindand air base in Afghanistan. The service is part of the company's overall Middle East concentration and adds current operations at both the Bagram and Kandahar Air Bases in Afghanistan. A Volga-Dnepr Airlines’ IL-76TD-90VD freighter has delivered diesel generators weighing over 35 tons from East Midlands in the UK to Bagram, Afghanistan. 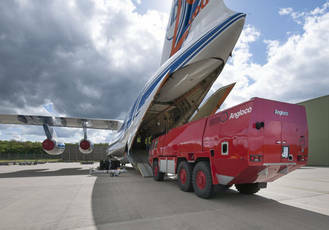 The oversized power generators, designed and manufactured by Dale Power Solutions, were placed in special shipping containers and rolled into the cargo cabin directly from the airside tarmac using a new wheeled loading system designed by Volga-Dnepr. The system eliminates the need for heavy tooling and third party loading equipment. Transact International expands with Contract Logistics Service To Shindand Air Base, Afghanistan. Transact International, a.k.a. Transact Intermediaries, a New York based third party logistics provider, has begun the first non-military cargo charter service into the Shindand Air Base. The service is part of Transact’s overall Middle East concentration and supplements current operations at both the Bagram and Kandahar Air Bases in Afghanistan. Thomas Anderson , President of Transact International received honors from coalition supporters at the NATO base in Kandahar, Afghanistan for providing a series of mission critical air charters into the region. Anderson, a 25 year veteran in the air forwarding industry has been active in the Afghanistan military theater supplying contractors with airlift capability from the USA and Europe. Transact Intermediaries President to speak at upcoming ZEXCO conference in NYC. ZEXCO 2012 International conference being held in NYC this year will bring Transact Intermediaries President and CEO Thomas Anderson to speak on the subjects of international cargo safety, security and his experiences in providing logistical support to Military Contractors in theater. Thomas Anderson, President of Transact International received honors from coalition supporters at the NATO base in Kandahar, Afghanistan for providing a series of mission critical air charters into the region. Volga-Dnepr, the Russian oversized and heavy cargo charter specialist, has successfully transported two Amdac Carmichael mobile fire-fighting trucks from the UK to Kandahar in Afghanistan. A Volga-Dnepr Airlines IL-76TD-90VD freighter has delivered diesel generators weighing over 35 tonnes from East Midlands Airport in the UK to Bagram, Afghanistan. The oversized power generators, designed and manufactured by Dale Power Solutions, were placed in special shipping containers and rolled into the cargo cabin directly from the airside tarmac using a wheeled loading system designed by Volga-Dnepr that eliminates the need for third-party loading equipment. Russia’s Volga-Dnepr Airlines has transported two Amdac Carmichael mobile fire-fighting trucks from the UK to Kandahar in Afghanistan. The 30-tonne cargo was carried from East Midlands Airport to Afghanistan’s second largest city located in the south of the country. The two units, weighing a combined total of 30 tons, were transported from East Midlands International airport using an IL-76TD-90VD freighter chartered on behalf of Transact International – a company specialising in military and humanitarian aid shipments.